Fast-growing weeping willows send out long branches that stoop and bend to the ground. Under normal circumstances, these branches are beautiful during the summer as their narrow leaves flutter and sway with the slightest breeze. However, if anything causes extra weight on the branch, whether it is snow, strong winds or a child playing, they can break. Thankfully, the tree will quickly regrow to repair the break. Trim back to the break, if possible. If a side branch has snapped, trim it cleanly just before the break at a 45-degree angle, facing downward. This will keep water from collecting in the cut and bacteria or fungi from entering the tree. If the break is close to the trunk, trim it to 2 inches from the bark of the trunk, at a 45-degree angle. Cut the broken branch just beyond the top of the cracking, if the break is in the center of the tree where two leading branches are pulling away from each other and one has pulled away enough to crack and fall down. Pull the tree together so the crack is closed, and hold it with plant tape. The cut should be as flat as possible and slanted away from the center of the tree. Reinforce the willow tree if the break has happened in the center of the tree, between two branches but no branches have fallen. A crack that is only 2 or 3 inches can be closed by drilling a hole straight through both sides, sliding a threaded steel rod that is just a little longer than the width of the tree through and then placing large washers and nuts on either end. Tighten the nuts gently on each side until the crack has closed. Over time, the tree will grow around the hardware. This is only useful for small to medium trees. Cut the tree down if the whole tree has cracked and has fallen over. Many times the willow tree will regenerate new growth rapidly from the roots and although you might not get a stately one-trunked tree, you will get a clump of willows. Make your cut clean and with a 45-degree angle for faster healing. 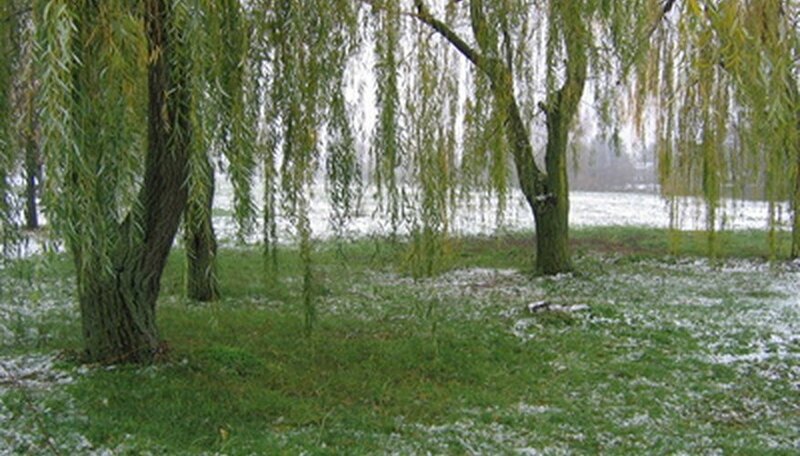 Hire a professional for large willow trees.